"Many years ago while in Bergen I bought some "Bla Kveite" at the Bergen's Fish Market. Our Norwegian friend prepared it for us-it was steamed -served with young summer potatoes and of course gurken salat och akvavit! I fish often off British Colombia and catch some halibuts-where can I get a recipe how to prepare and smoke the halibut the bla kveita style? As I remember it was only slightly salted and smoke? 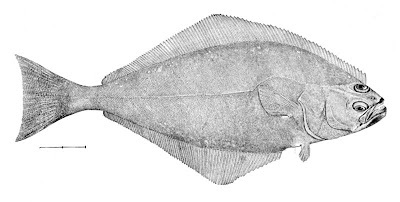 Blåkveite or Greenland Halibut is a subspecies of the halibut and has a circumpolar distribution and is found in both the Atlantic and the Pacific Oceans. I tried to look for a procedure on how to smoke halibut or Greenland halibut. I found that a Norwegian, Kjell Gilje has a description in Norwegian on how he prepare and smoke different kinds of fish including halibut. A rather bad English translation (google) may give you some information. I suppose it would be a good idea to contact him directly on e-mail to get further information. His e-mail is: kjell@gilje.org. Smoked halibut is a delicacy, and I have had the pleasure to enjoy thinly sliced halibut on a few hotel buffets. They have served the halibut cold with scrambled eggs or a cold potato salad. On www.matoppskrift.no, they recommend that smoked halibut is cut into one inch slices and boiled very gently for 7 minutes. In fact the water should not bubble merely be just at boiling point. The fish sould be served with boiled potatoes and fish stock thickened with a little cornflour and plenty of parsley. You will find a recipe on Norwegian cucumber salad here. I hope this has been at some help for you!